I read this article and found it very interesting, thought it might be something for you. The article is called Born and Reared – Hen Norton & Dan Dennison Interview and is located at https://www.totallydublin.ie/more/features-more/born-and-reared-hen-norton-dan-dennison-interview/. Born and Reared is a new, independent documentary about the lives of four people from different social and religious backgrounds, in a society where lines of identity have historically been sharply and violently drawn, affected by the Troubles and their legacy in the wake of the Good Friday Agreement. We sat down to speak with director Hen Norton and cinematographer Dan Dennison about this unique and moving project. Could you explain a little bit about what Born and Reared is, and how the project came about? Hen Norton: Basically, the film was born out of the fact that I was doing a piece of work in Derry which was completely different, where I was going into different community groups – people who met around MS [Multiple Sclerosis], sexuality and gender, women’s groups and men’s groups – and doing a piece of work with oral history around identity. Out of those conversations I met with a group called Men’s Action Network. 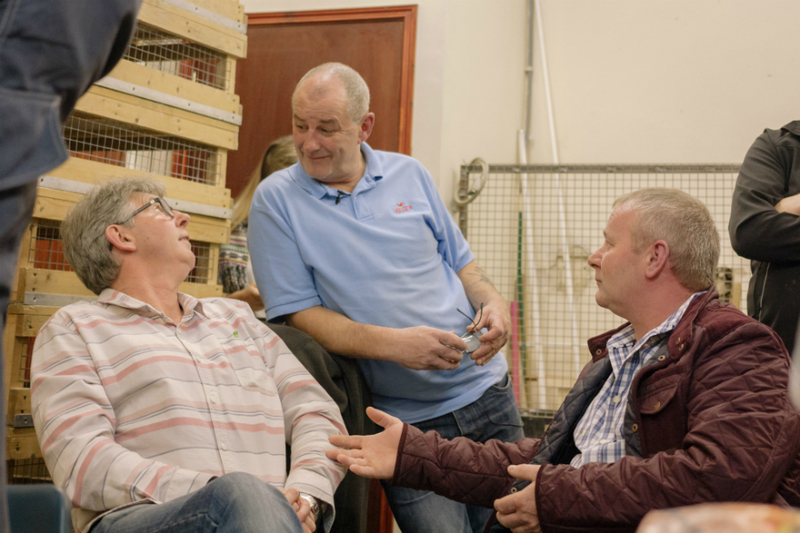 Men’s Action Network had been set up because a guy that some of the men knew had committed suicide and they had set up a sort of support group around that happening, and that had grown into a group for men where they could meet to discuss issues that affected them. Through my work with them, Dan and I started to talk about the things coming out of those conversations, and we were really interested in what happens when the cameras have left a place like Northern Ireland. What happens is a sort of legacy of war or conflict, particularly on men, because men are often talked about in terms of conflict and violence, and often women were being talked about in terms of peace. 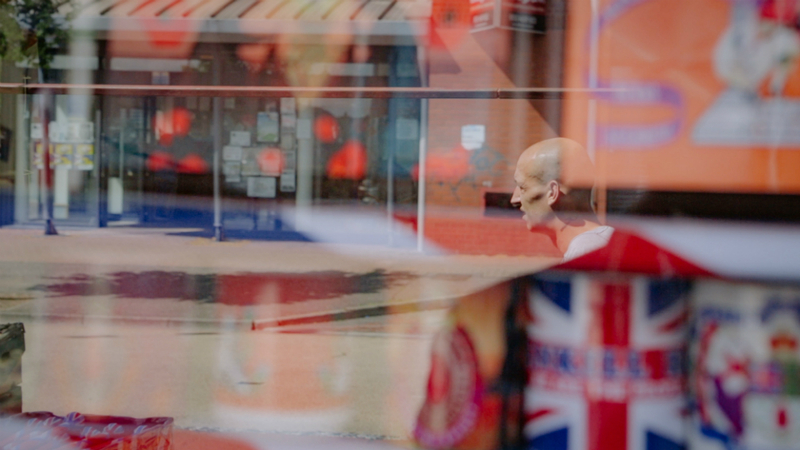 We’re interested in looking at the legacy of conflict on masculinity and male identity in a place, Northern Ireland. So in its simplest form the film is about four men living in Northern Ireland today, but it’s really about masculinity and identity and the legacy of conflict on those men’s lives. You say that you were working with a huge variety of people in Northern Ireland at the time, so was it a conscious decision – and at what point, if so – to whittle it down to including these four men’s voices specifically? HN: We knew really early on that we wanted to work with men, and that we were going to make a film about masculinity. But in terms of whittling it down to those four, it was really difficult. We worked with twelve men over the two years and for about 15 months we went for a week a month to Northern Ireland and we worked with each of those men, we kept going back and visiting all those men each time. So we were seeing each man once every six weeks. But it wasn’t until we got to the edit that we had to decide which of them we were going to work with. However it was always our intention not to discard any of the stories, so while we’ve got the film, we’ve got a series of twelve short films in development that we’re going to exhibit on an online platform, we’ve also created a zine with all of the men’s stories in it, and at some point we’re hoping to have some sort of local exhibition where you actually walk through all twelve of those stories. So for the purposes of editing it into a documentary film, we had to limit the number of stories because otherwise it was too diluted and too confusing, but in terms of the overall project, there’s a much broader conversation, and the men in the overall project are from all over Northern Ireland, from Ratlin Island off the north coast, to Derry, to Newry to Belfast. 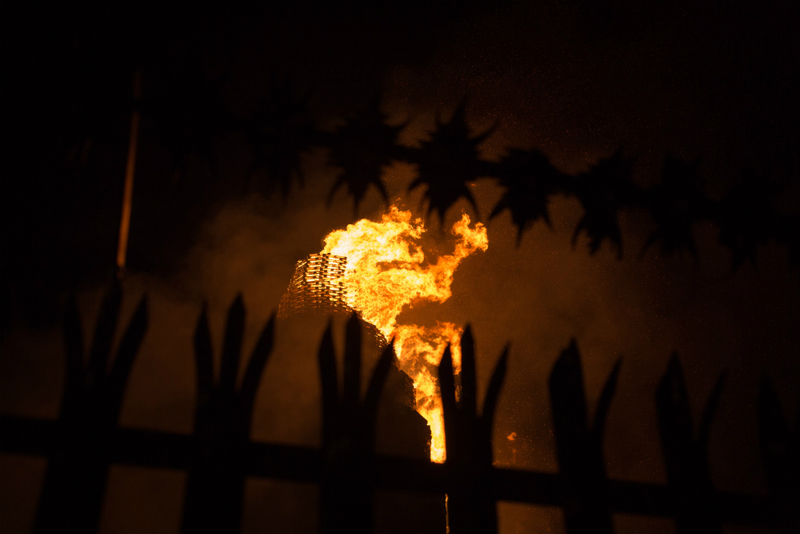 Some of the footage you got in the film is quite shocking – I’m thinking particularly of the bonfires and celebrations around the Twelfth – but were there moments in filming when you felt endangered or threatened? Dan Dennison: I mean from a filming perspective, the Twelfth: not really. 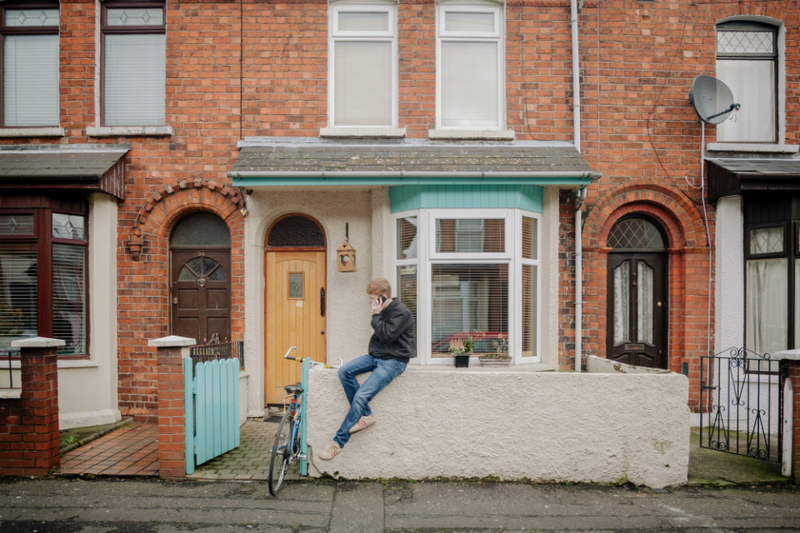 We worked with a camera assistant in Belfast, Ross, who was a fresh graduate of Queens’ film school, and he was able to not only help out on some of the filming on the night, but also to get access to some areas of that community because he himself was from a Protestant community outside of Belfast. So he was able to say, you know, “Come with us, you’ll be fine,” etc. So it was kind of an intense night: you can see that and experience that a little bit just by watching the segment at the end of the film. I never felt directly physically threatened or anything, but it was certainly intense being from outside of that community and, I suppose, in their eyes coming from the other side of the fence. HN: I’ve never been to something so intense in my life. It doesn’t matter where you came from or who you are, if you’re not used to those bonfires that take place on the 11th July: it is an enormous number of people burning giant bonfires, on which there is a flag – the Tricolour is on top of those bonfires – and people en masse feeling such enormous emotions, is a very intense and intimidating place to be. However we were never in any situations in which we were threatened. So it’s a complicated thing. We both came back to where we were staying and… I think it was a very moving evening, because it’s something that you don’t think happens within the United Kingdom, and it’s a sort of extraordinary thing to realise is happening on your doorstep. It’s something that, when we’ve shown it to people at private screenings in London and Dublin, when we were test-screening it back in January, and everybody who has seen it is just so shocked. HN: And as Brian says in the film, in his day you’d have run around your yard, you’d have collected some scrap and you built a bonfire, and whether one agrees with it or not you can see that it’s something that is, as they say, part of their culture, and a tradition. But what’s so shocking about this nowadays I think is the scale, and the fact that the government and the councils are putting money into those communities to purchase the pallets that they use to build those bonfires. And that is shocking. DD: And the act of burning the flag of another culture, another identity, is obviously a very aggressive act to be state-sponsored. Hen, you lived in Northern Ireland as a child, was what you filmed familiar to you from your memories of the place, or was it very much a different world? HN: I grew up in London but my stepmum was an MP, she was the Northern Ireland secretary during ’97 and ’98, Mo Mowlam, and every weekend we would fly out to her, and spend some of our holidays there and things like that. Obviously it was a completely different world because of what was happening then, and we couldn’t walk around the streets of Belfast without police. I always say I felt like I was looking out at it through the window all the time. However, it was also very present because the people we now see in authority were those people who were having conversations with her, who we knew and we met, at the time. But that’s not why I made the film: I went back there because I was invited for work, to go as a producer for City of Culture, but in hindsight I realise now that my relationship with Northern Ireland and my childhood had an enormous impact on my desire to tell that story. It was only six months into filming, naïve as that may sound, that I realised that this is an incredibly important thing, that I personally want to tell this story too. And I experienced very different things, because the place has changed, but I also now am an adult, and where I could go now was very different from where I could go then. I could go and find things that I couldn’t access then but could only hear about, were only talked about, or I could only see through car windows. So it was a completely different experience making the film, but I definitely re-visited places that I’d seen in a different time. There’s some extremely affecting archive footage in the film – I’m thinking specifically of the aftermath of the Sean Graham bookmaker’s mass shooting [of February 1992, in which five Catholic civilians were killed and nine wounded by the UDA, in retaliation to the Teebane bombing by the Provisional IRA weeks before] – how did you come across this? DD: Yeah! But that’s a whole other conversation and film. But Billy had said, “There were cameras there, there was footage of me, I’m pretty sure it was the BBC,” so we did a bit of digging and we found it, and it was even better than we could have hoped for really. We were really lucky with the archive footage in general, actually. It’s such a great, visual window into that time. HN: When we set out to make the film we said we wanted to make a contemporary story, but what we realised as we went on was that it was impossible to tell a contemporary story without contextualising it in its past. So the archive was a really powerful tool for us. 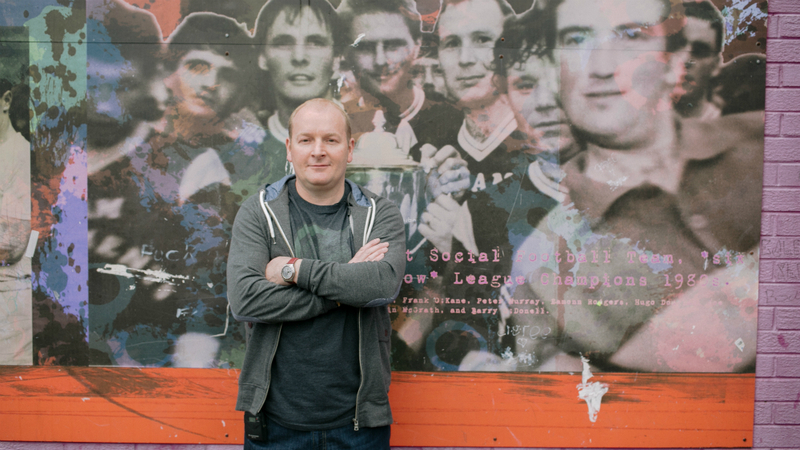 And it is really powerful when you see Billy standing outside Sean Graham’s on the Ormeau Road in 2015, and then you see that same shot from the archive in 1992. 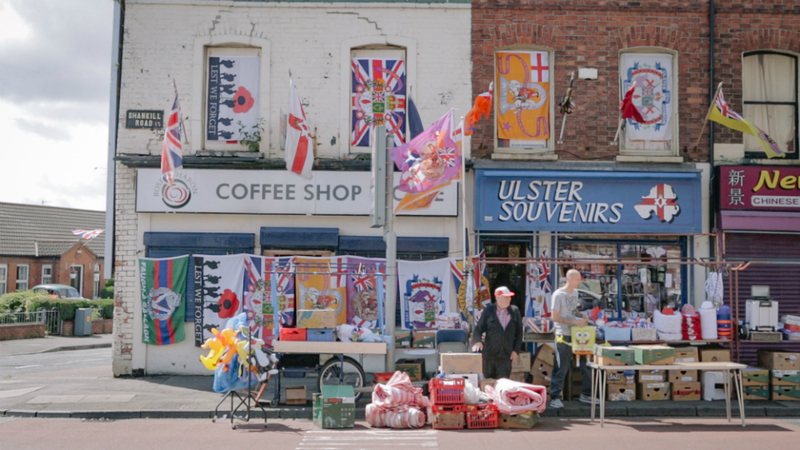 Belfast’s “peace walls” [seven metre steel fences separating Catholic and Protestant areas] are an aspect of the city’s geography that feature in the film, but that many people even from Ireland may not be familiar with. What are your thoughts on these, and the purpose they serve in the present day? HN: For me they’re the most shocking part of the entire situation. That these communities are still divided by walls in 2016, and it is understood that for them not to be divided is too alarming or dangerous a situation to consider. They symbolise something, they’re so visible when you’re there and they just reaffirm the divide. They ghettoise and divide people. But when I asked Billy about them he says, “The Berlin Wall is down, but we’re not gonna take ours down any time soon.” He says it would be great to take them down, but that he can’t see it happening. And I wonder what would happen if someone came overnight and just took them down… My instinct is that it might be OK, but I think that for people it’s just that they’ve been there for so long that they can’t consider them not being there. DD: I think Danny says it in the film as well, the fact that there’s such a physical reminder of otherness, that there is this steel wall with an other side, it’s brought home every time you see it: I should be thinking this way. So it just reaffirms that way of thinking. One final question: what are your plans for screening the film in Dublin this summer? HN: We’ve made this completely independently, so our endless thing is getting enough budget together to make things happen. But the plan is: we’ve had a private screening in Belfast, three private screenings in London, and we intend to bring it to Dublin in the next couple of months to do an initial private screening, and also to take it to New York and possibly Boston and Washington to do screenings there. We’re also planning, and are open to people approaching us about, doing community screenings in Ireland and Northern Ireland. And we’re in the process of putting it into festivals, Galway and potentially Cork… So we’re in the early stages of distribution, but I really hope we can get it out there further in Ireland in the summer or the autumn, because it’s been really well received.